Hexedit, is tool to edit the hex file. 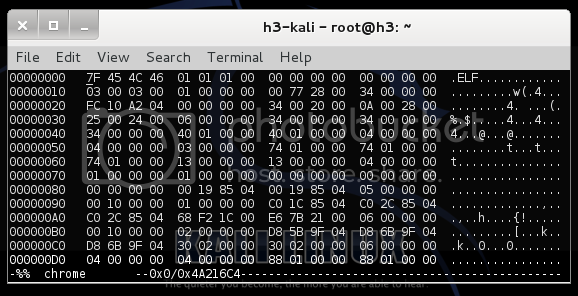 Hex file may contain a binary package which can be execute, after it has been compiled from the source code. Remembering on the last Backtrack, this tool still packaged with about over 300 another tools which ready to doing pentest action. But when i have installed Kali Linux, i did not see that tool again. Although there is another tool like GVim, but i more like Hexedit than another tool. Because Hexedit is lightweight. So we don't need a big resource to using that tool. Okay, because i did not found Hexedit on Kali Linux, i will installed it from the Kali or Debian repository. It the best way to installed Hexedit on Kali Linux. First, you need to open the source of your repository at /etc/apt directory. Second, add the new source of Kali repository (see recommended repository for Kali Linux), save and exit. Third, you can running update of apt and install hexedit package. After that you can remove the new source which have you added into list of repository source. Do update again, and now you can using Hexedit on your Kali Linux. Maybe it helpful when you want to installing Google Chrome (see Installing Google Chrome), to changing the code in order to Google Chrome can running at root permission level.